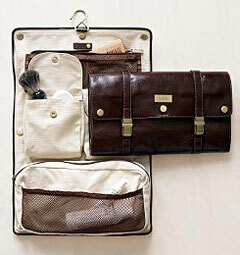 The Leather Excursion Case ($100) ,a RedEnvelope exclusive, is a must-have for the frequent travelers. This travel case lets you travel in style with a design features a durable cotton-canvas lining, brown leather with tan lining and brushed-brass hardware. It includes a hanging hook and dual strap closure, three pockets, one removable case and mesh pockets.